we’ll die if we go! and eat us I know! Originally posted in 2010. 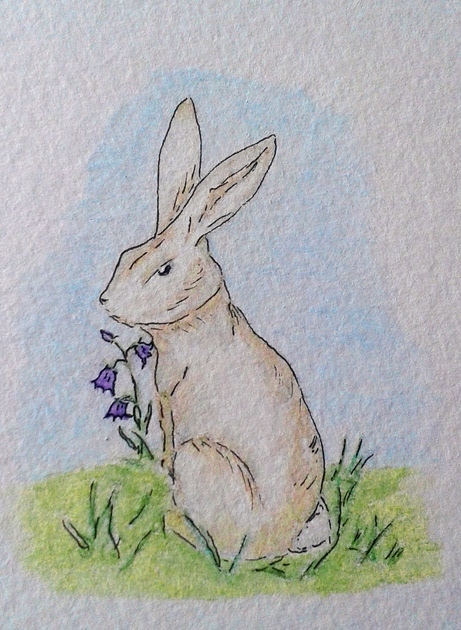 Had a blast with the little rabbit watercolor and then remembered I’d written something about rabbits a few years back. Hopefully this little guy survived that nasty cat! Mornings in the Trout household typically began when Mrs. Trout, in her pale blue robe with matching pale blue slippers, made her way down the hall and into the kitchen to put the kettle on. Once the kettle was filled with water from the sink and set upon the stove, Mrs. Trout would stand with her back resolutely turned until it deigned to boil. She’d once read, you see, that “a watched pot will not boil” and while a kettle was not quite a pot, Mrs. Trout concluded that the same complicated principals of thermo-ocular dynamics still applied and therefore she never, if she could help it, made eye contact with the kettle until it cheerily whistled, letting her know it was once more safe for her to turn about and continue making breakfast. From beneath his blankets, Phileas could hear the kettle whistling in the kitchen and knew that his mother was even now reaching for pans, cracking eggs, and beginning to mix up what would undoubtedly be another cheese omelette for his breakfast. It wasn’t that Phileas particularly minded cheese omelettes, but some mornings he couldn’t help but think that a simple bowl of cold cereal and milk would make for a nice change of pace. Remembering the cheesy noodle casserole, the cheese drenched broccoli, and the toasted cheese bread from the previous night’s dinner, he thought that this was definitely one of those mornings. Phileas stretched his legs until his bare feet popped out from beneath his blankets. He wriggled his toes in the cool air and squeezed his eyes shut, knowing that in a few short minutes, his mother would be calling for him to get out of bed and come eat his breakfast. He’d asked for cereal once or twice before, only to have his father briefly peer at him over the morning paper and utter a rather sharpish “Nonsense, boy!” before going back to reading the agricultural news, no doubt deeply fascinated by the latest in dairy related innovations. Phileas whipped the blankets off his face and sat up in bed. “Who’s there?” he called to the empty room. His books sat stacked upon his desk. His clothes were piled at the foot of his bed right where he’d left them. His closet door was shut tight, holding back the mess which stood taller than he was and would no doubt be a small avalanche when his mother ventured to open the door. In other words, nothing looked any different than it had when he’d gone to bed the night before. He looked in what he thought was the direction the noises and voice had come from. He’d heard of ghosts, of course, but as he didn’t know anyone who had died, he didn’t think anyone would have a reason to haunt him. And really he wasn’t sure he actually believed in them, even if his mother swore they were real. “Is there someone there?” he asked quietly to the room. “No,” came a very small voice. Phileas gave a little jump. He could see no one! But he knew he hadn’t imagined the voice. “I heard you!” he said, half hoping he really hadn’t. “No you didn’t,” came the very small voice, sounding just slightly smaller than before. “I heard you again!” cried Phileas, now really hoping he hadn’t. “Two-Legs?” said Phileas. “Who are you?” he asked. “Nobody, Two-Legs,” said the voice. “Where are you!” demanded Phileas, kicking the blankets off his legs and jumping onto the floor. “Nowhere!” cried the voice, going up a pitch as if in fright. “Tell him he’s sleeping,” said another small voice. “You’re sleeping!” cried the first small voice, sounding just a little desperate. “I’m not sleeping!” said Phileas. “There are two of you now. Who are you?” Phileas dropped to his knees and peered beneath the bed. Nothing but a pair of socks and a small ball of dust. He crawled across the floor and dug into his small pile of clothes. Nothing but clothes. “Better come out before I find you!” said Phileas, whipping his head around. “Or what?” said one of the small voices. “A-ha!” cried Phileas, lunging for the lamp at the same exact moment two tiny gray-furred creatures leapt from the shade. “Eeee!” they squealed as they disappeared behind the dresser. Phileas was so surprised, he tripped over a shoe and landed hard on his hands and knees. Mice? he thought wildly. He’d been hearing mice? But mice couldn’t talk, could they? He supposed they must have their own sort of mouse language, of course. But he couldn’t speak mouse. Could he? How could he speak mouse and not know it? What would people think? “Phileas! Breakfast!” called his mother from the kitchen. Phileas shuddered. Was he mad? Had he gone to bed completely normal only to wake up crazy? Was that how it happened? “I won’t really explode, dear,” Phileas heard his father respond. “Only think of the mess!” called his mother. “But, dear, you clearly said…” replied his mother. And then it hit him. He had become just like them. Phileas Wensleydale Trout was embarrassing.